We all use AC wall chargers to charge our smartphones on an everyday basis. Be it Android, iOS or Windows, we all use the default chargers that came bundled with our smartphones. Did you ever give a thought to the reason for slow/fast charging times for different devices? Why does my phone charger take 2 hours to go from 0% to 100% even though the battery capacity is less than 3000mAh? Why does the same phone take half the time when charged using another charger? Every charger has input/output voltage figures mentioned on them. While most generic chargers have an output rating of 5V - 1 ampere at maximum, the chargers that charge faster generally have a 2.1 amperage (max). This is the reason behind your phone getting charged quickly. Smartphone manufacturers keep 1a chargers bundled in the package to keep the costs low, in some cases the batteries used in the smartphone are qualified to be used by 1a chargers only. However, nowdays most batteries/smartphones can easily handle a 2.1a charger. If your smartphone is comparatively new, I suggest you to use a 2.1a charger without any second thought. All branded chargers usually have power ratings written over them. To be able to check if it's a 1a or 2.1a charger, read the figures mentioned in the 'Output' column. Alternatively, if there are no numbers mentioned on the charger, the easiest way to check is by measuring the current flow from the charger. However, if you aren't an engineering student or an engineer by profession, chances are, you wouldn't have the equipment to check it. There's also a paid version of this app that has additional features, but the free version is good enough to check basic details. 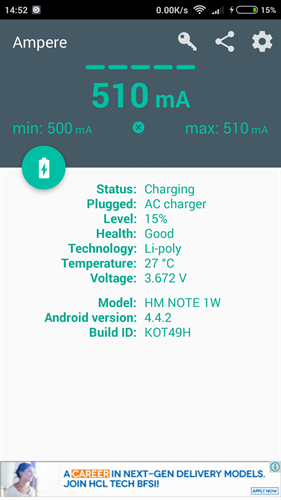 I've tested this app using various chargers (AC and USB) and its pretty accurate. With the help of this app, I have also been able to iron out some issues that I never knew existed with AC chargers. Sometimes, while using a 2.1a charger my phone still used to take a long time to get fully charged. On most occasions, it would take a little more than an hour to get to 100% but on some occasions it would take more than two hours. During one of these occasions, when the phone was pretty slow at being charged, I fired up this app only to realize it is charging at less than 500mAh. Once I physically removed the charger from the wall socket and replugged in, the ampere reading went up to 1500mAh. This was 3 times faster than what I was getting a few minutes ago. After this experience, I realized that even if you are using a good quality 2.1a wall charger, sometimes the connection between the wall outlet and the charger pins is faulty. Once you reset it, the maximum possible current starts to flow through. With the help of this app, I now easily check the current flow rate before leaving the phone for charging. Wait until the app measures. Since a smartphone when switched on uses a lot of battery power for various processes, this app may not be able to display the real-time current flow from the wall socket accurately. However, it is a good feature that gives you an idea of the wall charger quality and capability. This app is also a good option to check the output levels of a power bank. This may be an asset for people who review products like power banks and can judge its performance. A lot of companies advertise their products as 2.1a, whereas, in reality, they're nothing more than 1a. I recently bought a Portronics 2.1a charger from Flipkart for myself. The product I received was packed very well and had the company branding all over the packaging and the product. Once I started using it, I decided to check the output level it was supplying using this app. To my utter shock, I realised that this charger did not supply more than 400mAh of output even after checking it for more than 20 times. I used different USB cables suspecting the cable to be the culprit, however, the output remained the same. This is when it occurred to me that this product could be fake. I checked the official website of Portronics and saw that the same product although had the same packaging box, but was different in colour. Moreover, the original had input/output values mentioned on the charger but the one I received did not. Once I was sure this was a fake product, I immediately raised a refund request. All thanks to the Ampere app and Flipkart's return policy, I was saved from being stuck with a fake, low quality, overpriced wall charger. I've used this app on various devices available in my household and realised that on some devices, this app is also able to display the phone battery's consumption rate. As an example, I used this app on my trusty old Nexus 5 without charging, and it displayed around 200mAh as what my phone's using up in its current configuration. Once I lowered the brightness level and closed all the running apps in the background, this value dropped a bit to 180mAh. Pretty cool isn't it? This app is freely available on the Google Play Store and is a must for every person with a smartphone and technical bent of mind.